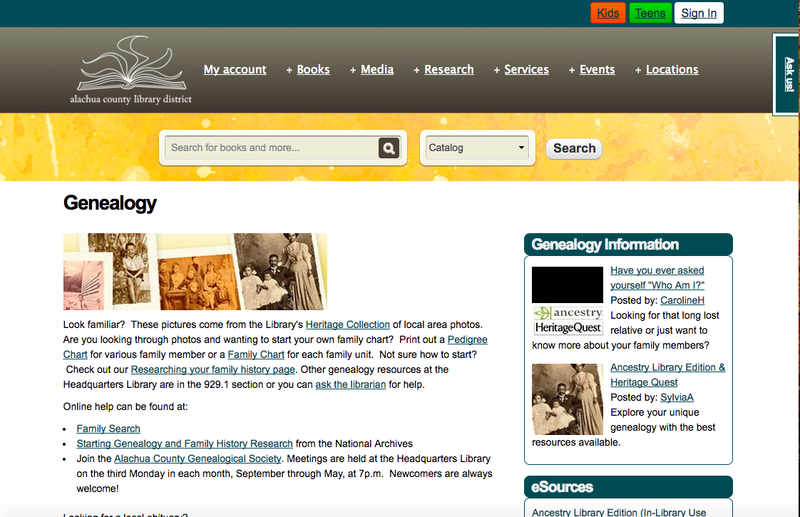 There are several large genealogy libraries scattered around the United States. One of the most prominent is the Mid-Continent Public Library's Midwest Genealogy Center. Located at 3440 S. Lee's Summit Road in Independence, Missouri. Here is a short history of the Center from its website. The Independence Public Library was formed in 1892 by the Independence Library Association, and Miss Carrie Wallace, a relative of former First Lady Bess Wallace Truman, was the first librarian, serving until 1947. She was instrumental in laying the ground work for the establishment of a genealogical library in the local public library. Early donations by the Independence Pioneers Chapter of the Daughters of the American Revolution (DAR) were the first genealogy materials collected by the Mid-Continent Public Library. The Jackson County Public Library, Mid-Continent Public Library's predecessor and successor to the Independence Public Library, was formed in 1947. In 1971, MCPL acquired a collection of Missouri county histories, and the "Missouri Room" was opened at the Independence Branch to accommodate patrons pursuing local historical information. In 1972, the North Independence Branch of the Mid-Continent Public Library became the home of the genealogy collection. 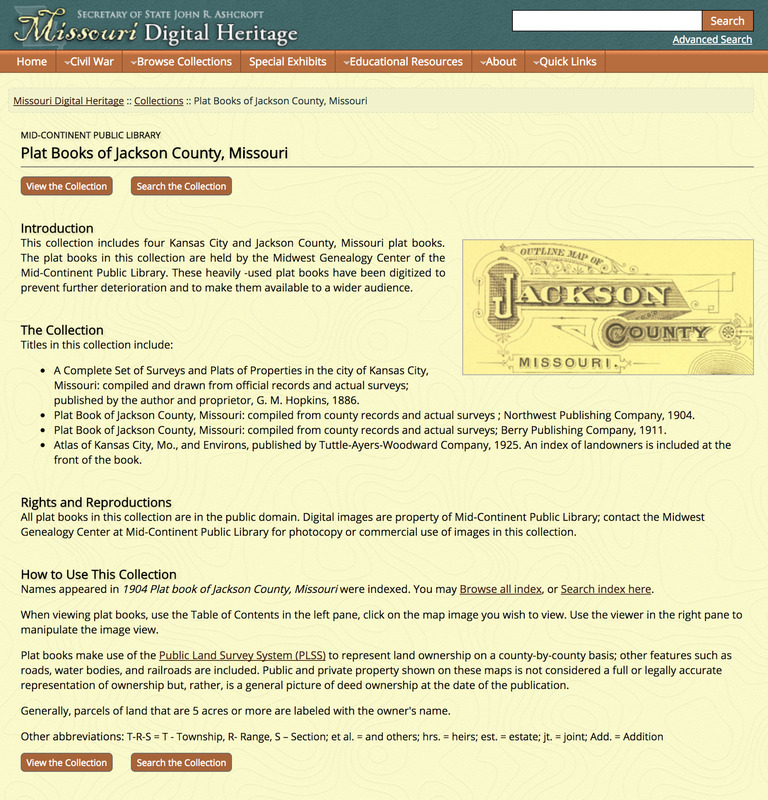 In 1996, the collection was moved to the facility that became the MCPL Genealogy and Local History Branch, and in 2008, the Midwest Genealogy Center was opened at 3440 S. Lee's Summit Road in Independence, Missouri. 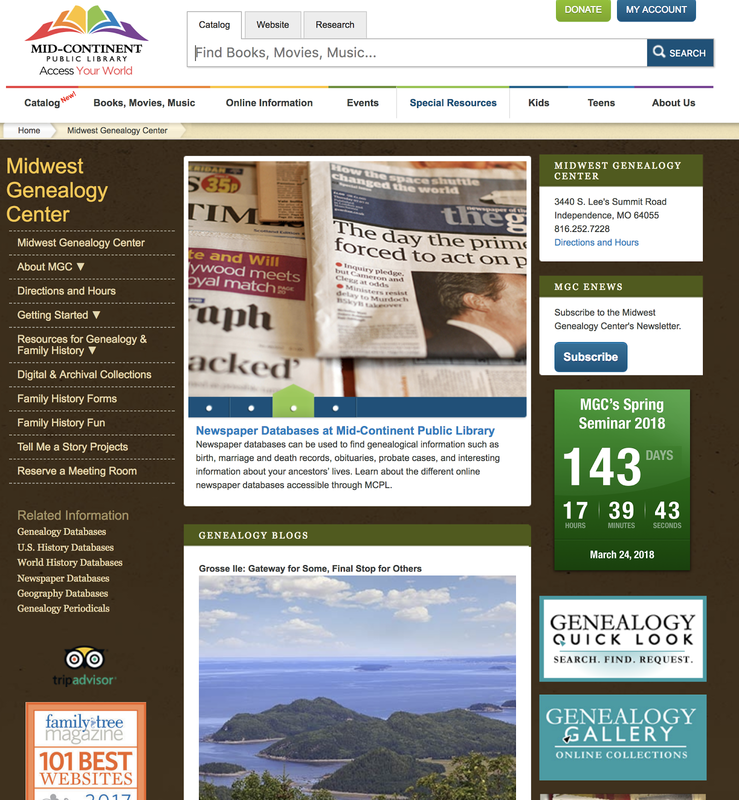 Since the initial donation of a single $14.64 book by the DAR in 1927, the Midwest Genealogy Center's collection has grown to over 17,000 circulating titles, more than 85,000 reference titles, and a vast number of periodicals and newspapers, as well as microforms, maps, and online databases. The Center's website has a significant collection of online material also. 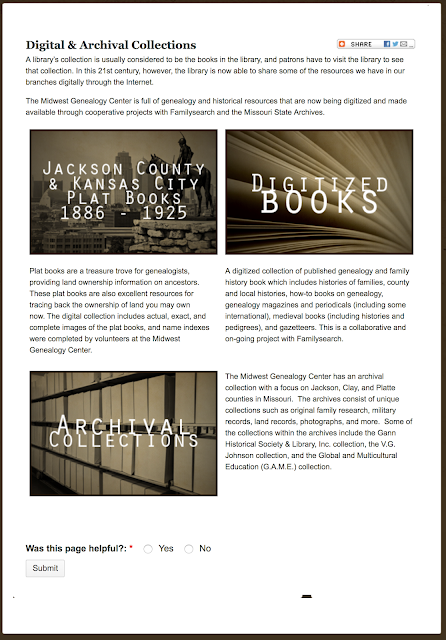 The Plat Books are part of the Missouri Digital Heritage website. 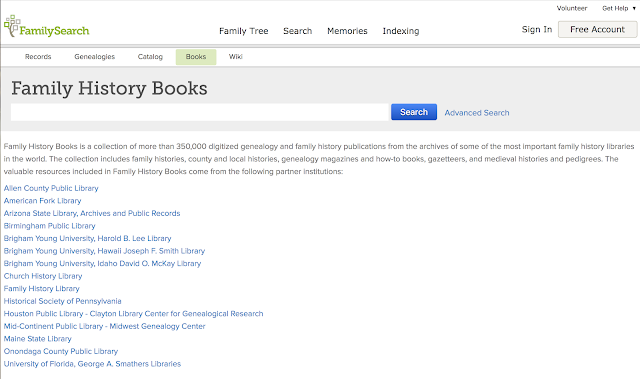 The Digital Books collection is housed in the FamilySearch.org Books section. 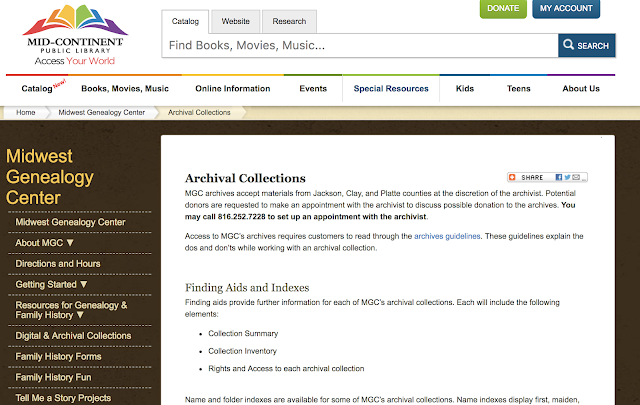 The Archival Collections are actually online on the website. The Center should be on every genealogist's list of resources. A paradox occurs when an absurd or self-contradictory statement or proposition, is investigated or explained and then proves to be well founded or true. Pedigree collapse is paradoxical. You would expect that the number of your ancestors would continue to increase exponentially. But the reality is that they don't. As I mentioned in the first installment of this series, ultimately, the idea of pedigree collapse postulates that all humans are descendants of a single person or perhaps a small group of people in Africa. What is becoming evident by the DNA studies is that presently all humans are humans by virtue of their shared DNA. Here are a few articles discussing this issue. What does this have to do with genealogy? Ultimately, genealogy is based on written records and the existence of those records. DNA, on the other hand, is based on random combinations of genes in our chromosomes. The differences between the two lie in the First Rule of Genealogy: "When the baby was born, the mother was there." In genealogy, the implications of this Rule are far-reaching. Essentially, mothers can be identified with a greater degree of certainty than fathers. Here is a simple example of the problem. Look at your pedigree chart. 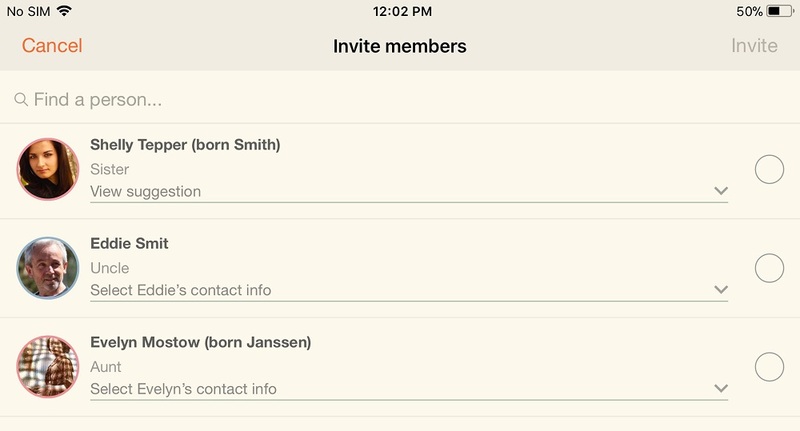 It lists those people who your inherited genealogy or your own research are shown as biologically related. But how do you know that the information you have on your chart is accurate? The answer is that you don't. Your conclusions are based on written records that may or may not have been accurate. For example, you may believe you are related to your known parents. You may even have a birth certificate to "prove" that relationship. But a DNA test may reveal that your named father is not your biological father and the same thing goes for your mother also. What about all those generations of records where you do not have a DNA test to support a biological relationship? What about all those children born out of wedlock or recorded marriages? How many of these relationships were culturally hidden? One thing is certain. You get a random mix of genes from your parents. See "Relatedness." Another fact is evident, DNA testing results can disturb assume relationships. See "Couple discover they are siblings: Child courts blamed after strangers fall in love, have a son - and then find out they are half-brother and sister." When you undertake the journey of discovering your ancestry, you are entering a world where marriage between closely related people is not only possible but in the case of European royalty and other historically related groups of people, common. From another standpoint, identical twins do not have identical DNA. See "Identical Twins' Genes Are Not Identical." Before extensive DNA or genome sequencing became available, it was commonly believed that identical twins had identical DNA. But this has more recently been shown to be an inaccurate conclusion. So what is the "real" relationship between genealogical research and DNA? Both approaches provide information about a similar subject: relationships between humans. Both have limitations. Ultimately, DNA testing relies on statistical analysis. See. for example, "On statistical analysis of forensic DNA: Theory, methods and computer programs." When a genealogical DNA test is interpreted, the results are expressed as a statistical percentage correspondence or an "estimate." These ethnicity estimates are often combined with reports of DNA matches of varying percentages of DNA. These percentages are, for the most part, based on very small percentages of "shared" DNA. Unfortunately, a large percentage of these matched people do not have supporting family trees that allow an actual relationship to be established. In other words, even when the DNA matched person has an online family tree, there is no apparent genealogical relationship evident. Without a carefully documented and evaluated genealogically researched family tree, DNA testing is nothing more than an interesting estimate. If you recognize this image, you will realize that it constitutes a theoretical limit of time and a physical limitation of possibility. If we considered this chart to represent your possible ancestors, we can see that by the time we go back 12 generations we have the potential of 4096 grandparents. By going back 24 generations, we accumulate 16,777,216 grandparents. Estimates of the total number of people that have lived on the earth run around 108 billion. That number is exceeded by the 27th generation. A generation, according to the International Society of Genetic Genealogy Wiki, in an article by Donn Devine, CG, FNGS entitled, "How long is a generation? Science provides an answer" the common estimates used by genealogists are questioned. Quoting different studies, the answer to the question about the length of a generation is about 33 years for male lines and about 29 years for female lines. However, depending on the study, the numbers range from 31 years for male lines to 38 years and from about 25 years to 29 years. The intervals were calculated on the average age of the mothers from the birth of their first child to the age at last birth. Given these figures and using the 25-year interval, as the article observes, 20 generations in the past would put an ancestor in about the year 1500 at the outer limits of genealogically useful records in European countries and most of the rest of the world. Nonetheless, you would still have a potential of 1,048,576 direct line ancestors at that point in time. Personally, I do not know anyone who has approached a documented 20 generation pedigree of more than one or two lines at the most. So for all practical purposes, there is no real way to determine who we are related to back even 20 generations and from my own experience, any pedigree going back more than 20 generations is highly suspect. I would also suspect that these same limits apply to the accuracy of DNA testing results because of the absolute certainty of pedigree collapse, i.e. where people sharing a common ancestor produce offspring. For example, because of the new family tree technology, it is fairly certain that I am related to both my wife's father and her mother, although many generations in the past. Now, if you try to think this through, you will begin to see that DNA testing has some interesting limits. We know that the actual world population in the past is no longer even realistically represented by the required number of direct line ancestors and ultimately, as is reported by a number of researchers, we are all descended from a couple of proto-ancestors. Here is a summary of the issue from the Wikipedia article on "Human evolutionary genetics." By the way, dividing those estimates of years by 25 gives us 5,600 generations to 11,600 generations. What this implies is that over time genes are lost from the "gene pool." So, if we go back far enough, the geneticists agree that there is pedigree collapse to the point that we all share a common ancestor, but on the other hand just going back a mere 39 generations or about 975 years implies that we have over 549 billion direct line ancestors. Stay tuned for futher discussion and observations. Connecting to a royal line has always been either a stated or unstated goal of genealogy. Historically, aspiring kings and queens turned to hired genealogists to provide them with the legitimacy of nobility or royalty. 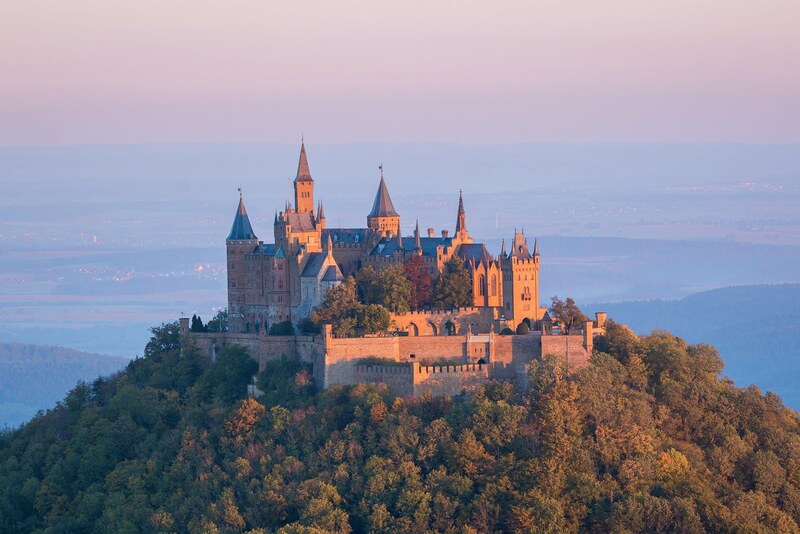 The reality is that a legitimate connection to a royal or noble line involves the same careful, documented and substantiated genealogical research as any other ancestral connection. As I have said and written many times, kings and queens and those claiming noble birth had children just like all of your ancestors and because of inexorable pedigree collapse, you just might have an ancestor with royal or noble blood. First of all some definitions. Guess what royalty is one of the vaguest terms you can use in genealogy. In essence, it simply means that you have "royal blood" which generally accepted a being able to trace your ancestry to a king or queen. Nobility, on the other hand, is even vaguer. A noble is anyone of a group of people belonging to the noble class in a country, especially those with a hereditary or honorary title. Proving that you have a noble ancestor may be somehow satisfying or increase your sense of self-importance, but unless your research shows that you are actually entitled to inherit the title, it is pretty meaningless. There are long-running genealogy-oriented websites that promote the idea of being related to famous people, including royalty. For some, this may be a major motivation for doing genealogical research. In fact, there are several programs online that use family tree programs to show how you may be related to royalty. In my experience, these connections are more wishful thinking than well-documented reality. If having a king, queen or noble in your family line seems important to you, go for it. But spend the time to do a careful, accurate and documented job of discovering your ancestry. Don't just assume that your assumptions, hopes or family traditions are correct. 2. “In my family records I found an interesting genealogy that ties us into one line of European royalty going through Charlemagne back to one Antenor, King of the Cimmerians, then to Judah, and thence through Abraham and Noah to Adam. Can you tell me how reliable lineages such as these are?” The answer to this question was provided by Val D. Greenwood, temple ordinance specialist for the Genealogical Department of the Church. By the way, most of my motivation to learn about genealogy came from a book written by Val D. Greenwood. Here is the reference to the book. Here is a quote from Val D. Greenwood's answer to the above question that pretty well tells us all that should we do enough research, we will always find a royal line. If a person goes back only ten generations (approximately 300 years) he has 1,024 different direct lines of ancestry (barring the possibility that he runs into some of the same lines more than once). Another ten generations (middle fourteenth century) would give him 1,048,576 ancestral lines. The next generation would have 2,097,152, and the one after that 4,194,304. This would take the average pedigree into the last half of the twelfth century—still about seven generations later than William the Conquerer and about fourteen generations later than Charlemagne (born in A.D. 742). To double the ancestral lines fourteen more times would give us more than 68.7 billion potential lines (34 generations of progenitors). This, of course, is ridiculous, because there have not been that many people in the entire history of the world, let alone in Europe in the eighth century. Obviously we all run into some ancestral lines more than once—some we run into many times—in that many generations, and, with those kinds of odds, it is relatively safe to suppose that if our ancestry is European we are probably descended from Charlemagne and from every other eighth century couple who have living descendants today. In genealogy, pedigree collapse describes how reproduction between two individuals who knowingly or unknowingly share an ancestor causes the family tree of their offspring to be smaller than it would otherwise be. The term was coined by Robert C. Gunderson, first supervisor of the Genealogical Society of Utah's Royalty Identification Unit. Pedigree collapse is also known by the German term Ahnenschwund which roughly translates as "loss of lineage". Technically, this is also a good argument against the idea of distinct genetic ethnologies in DNA testing, but that is another issue for another post. Genealogists should be aware that ongoing state-level digital newspaper projects are constantly continuing to add more free digital newspaper pages. This notice from the Colorado Virtual Library announces that they have digitized a million pages. Here is a quote from the announcement that was published over a month ago. Growth of Database Causes Great Excitement. New Titles Added – More Counties Represented. DENVER COLORADO. 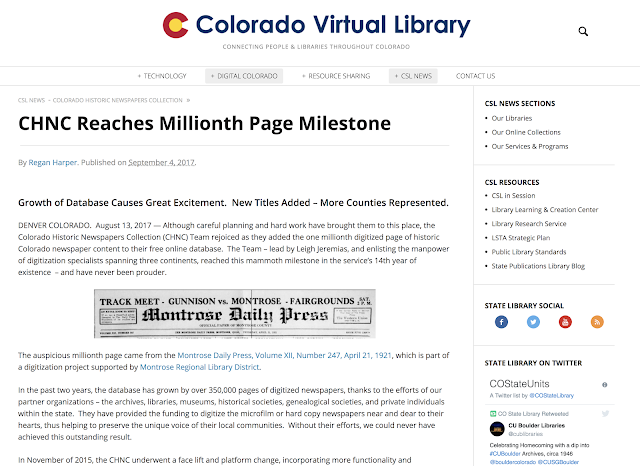 August 13, 2017 — Although careful planning and hard work have brought them to this place, the Colorado Historic Newspapers Collection (CHNC) Team rejoiced as they added the one millionth digitized page of historic Colorado newspaper content to their free online database. The Team – lead by Leigh Jeremias, and enlisting the manpower of digitization specialists spanning three continents, reached this mammoth milestone in the service’s 14th year of existence – and have never been prouder. The auspicious millionth page came from the Montrose Daily Press, Volume XII, Number 247, April 21, 1921, which is part of a digitization project supported by Montrose Regional Library District. In the past two years, the database has grown by over 350,000 pages of digitized newspapers, thanks to the efforts of our partner organizations – the archives, libraries, museums, historical societies, genealogical societies, and private individuals within the state. They have provided the funding to digitize the microfilm or hard copy newspapers near and dear to their hearts, thus helping to preserve the unique voice of their local communities. Without their efforts, we could never have achieved this outstanding result. 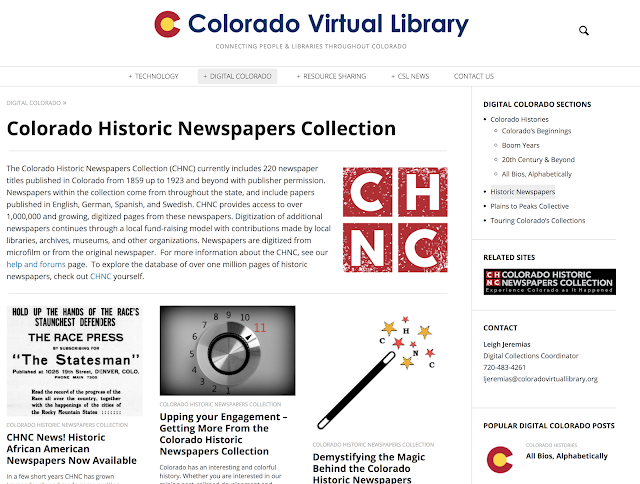 Here is a screenshot of the Historic Newspapers Collection from Colorado. Like some of the larger collections, such as Trove.nla.au.gov from the National Library of Australia, the Colorado collection lets users correct the text of the OCR scanned text. Unfortunately, many of the large online genealogy websites do not seem to include their millions of users in the process of correcting their text and indexed entries. You should be aware that all fifty states in the United States have digital newspaper collections. I did a list some time ago, that is now somewhat out-of-date, but still useful. See "Online Digital Newspaper Collections by State -- The Lists by State." The genealogical community is slowly beginning to recognize the fact that there is a decided movement to mobile devices for online computer usage. 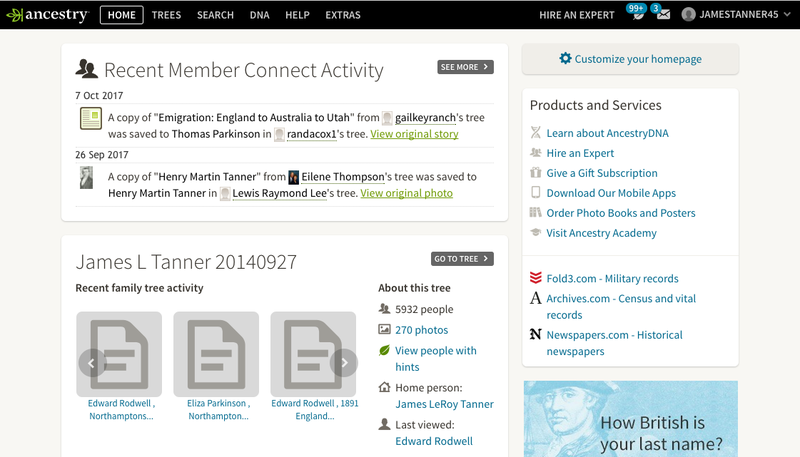 MyHeritage.com is among those leading the technological changes that are inevitably changing the face of genealogy on a very personal level. 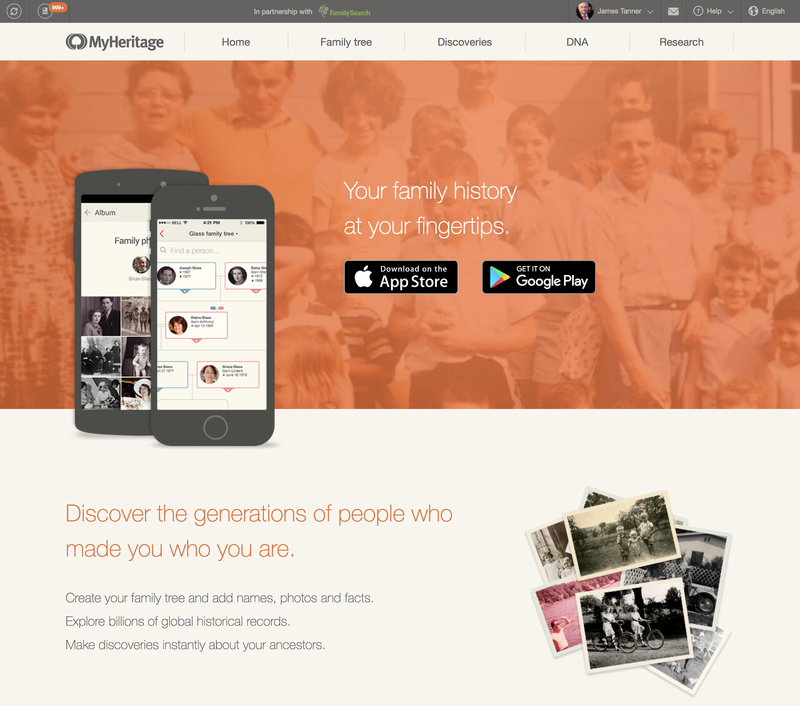 The new updates to the MyHeritage.com mobile app illustrate the direction of the changes. To read more about the changes, see the MyHeritage.com blog post, "New Update to the MyHeritage Mobile App." Hello again, from Reclaim The Records! We're back with an uncharacteristically short but very important newsletter. 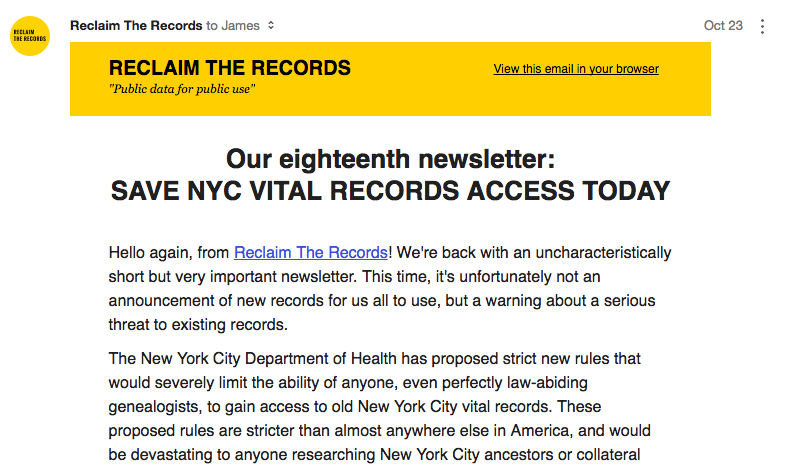 This time, it's unfortunately not an announcement of new records for us all to use, but a warning about a serious threat to existing records. 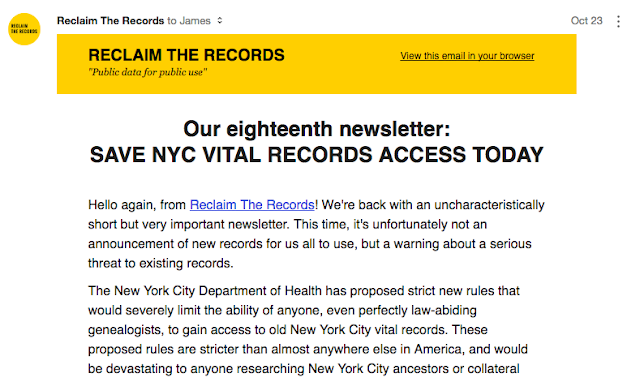 The New York City Department of Health has proposed strict new rules that would severely limit the ability of anyone, even perfectly law-abiding genealogists, to gain access to old New York City vital records. These proposed rules are stricter than almost anywhere else in America, and would be devastating to anyone researching New York City ancestors or collateral lines. But there's something you can do to help stop this. Right now, from your home computer, you can click this link and read the proposed rule changes on the Department's website. Then scroll to the bottom, click "register" and log in, and then post your public comments, which will be sent directly to the New York City Department of Health. If you live in New York, make sure to mention that in your comment. The deadline to submit your comments is 5 PM Eastern time on Tuesday, October 24, 2017. For most of you reading this with your morning coffee, that's today! So please don't delay, and submit your comments right away, before 5 PM. Reclaim The Records will be in attendance, along with many other groups representing the open records community and the New York genealogy community. We'd love to see you there too. So go, click that link and leave your comment! And we'll save you a seat if you can make it to the meeting. Here is my comment to the proposed rule change (I am quoting myself). As a practicing trial attorney for 39 years and a genealogist for more than 35 years, I am deeply concerned about the changes in the General Vital Statistics Provisions (Article 207 of the NYC Health Code) regarding Birth and Death Records. Both the proposed time periods for death and birth records are unnecessarily excessive. The general references in the supporting information to "privacy" concerns and possible instances of identity theft are totally unsupported by either facts or reality. All of the information contained in both birth and death records is easily obtainable from presently available public records online. As an attorney, for a very small fee, I could obtain the information available in both birth and death records from multiple online companies who specialize in supplying such information. For example, most doctor's offices require much more information than is supplied by either certificate to obtain the services of a doctor. Targeting these two records serves no purposes. Restricting the availability of death records such as the recent restrictions on the availability of the Social Security Death Index, in fact, opens more opportunities for fraud rather than restricting such actions. Extending the time periods and adding restrictions to these particular records is motivated by the desire of the government agencies to enhance a revenue stream obtained from selling copies of these records to family members who are required to provide these documents for a variety of purposes. I see no reasons for extending the time periods for either of the two types of records. I might add that instances where either death or birth information have been used for fraudulent purposes include unsupported claims to the Internal Revenue Service (IRS) for tax exemptions or refunds. But in these cases, the restrictions on the public availability of birth or death certificates is not the problem. The real problem is these cases is the lack of internal controls by the IRS. For example, the IRS could check to see if the people claimed as living deductions were dead and whether or not the person claiming a live exemption was actually related to the person claimed. In this case, the New York City Department of Health is trying to extend the available time periods to 125 years for birth certificates and 75 years for death certificates. Here is an announcement from MyHeritage.com. You might remember that MyHeritage purchased both the Legacy Family Tree program and the Legacy Webinar series. This is apparently one of the first offerings directly from MyHeritage. Here is the text of the announcement. I'm happy to invite you to attend MyHeritage's first One-Day Genealogy Seminar, to be held on October 29, 2017 from 7 a.m. to 3 p.m. EDT. Learn from experts in the fields of DNA, Jewish genealogy, general research techniques, and technological trends in genealogy. MyHeritage will broadcast the lectures from our headquarters in Israel, and the public is invited to participate via Legacy Family Tree Webinars from anywhere in the world for FREE. Recordings of the lectures will later be available to view on demand for free. To register, click here. Please share this with your friends and followers. This is the kind of story that you might usually expect on the cover of a supermarket tabloid, but apparently, there is some support for this updated disclosure. 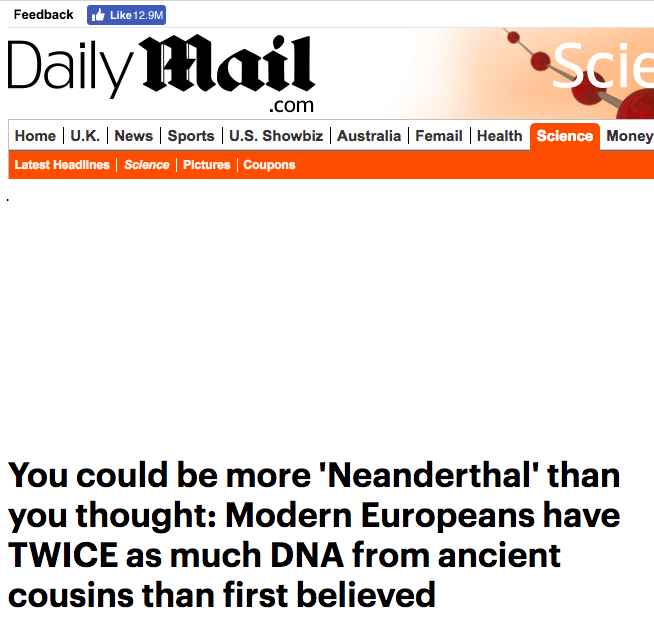 Some genealogists who have taken popular DNA tests have been getting results showing a small percentage of Neanderthal DNA for some time now. A search on WorldCat.org results in over 1200 books and other publications on the subject of Neanderthal DNA. Checking on the website of the International Society of Genetic Genealogy (ISOGG), there are two companies that represent providing Neanderthal DNA percentages: 23andMe.com and the National Geographic, Genographic Project, Geno 2.0 Next Generation Test. To date the only Neandertal genome that has been sequenced to high quality is from an individual found in Southern Siberia. We sequenced the genome of a female Neandertal from ~50 thousand years ago from Vindija Cave, Croatia to ~30-fold genomic coverage. 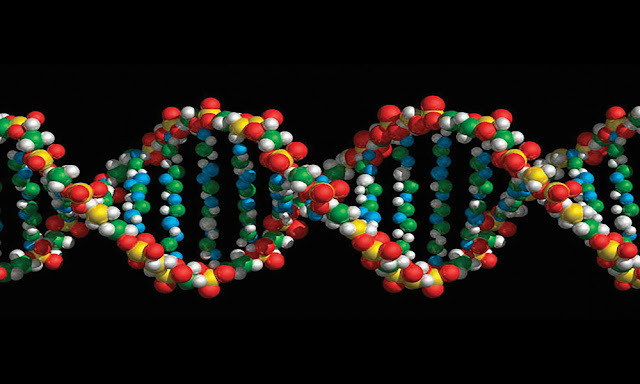 She carried 1.6 differences per ten thousand base pairs between the two copies of her genome, fewer than present-day humans, suggesting that Neandertal populations were of small size. Our analyses indicate that she was more closely related to the Neandertals that mixed with the ancestors of present-day humans living outside of sub-Saharan Africa than the previously sequenced Neandertal from Siberia, allowing 10-20% more Neandertal DNA to be identified in present-day humans, including variants involved in LDL cholesterol levels, schizophrenia and other diseases. 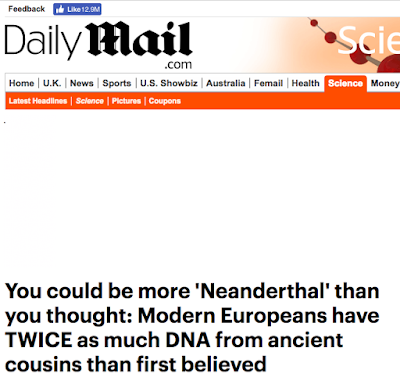 Perhaps this type of finding gives genealogists a little more accurate assessment of the value of the ethnicity estimates that are now popularly provided with genealogical DNA tests. Section 108(h) of the Copyright Act gives libraries the power to scan and serve copies of out-of-print books published between 1923 and 1941; it's never been used before but now the mighty Internet Archive is giving it a serious workout, adding them to their brilliantly named Sonny Bono Memorial Collection (when Bono was a Congressman, he tried to pass a law that would extend copyright to "forever less a day" and was instrumental in moving millions of works from the public domain back into copyright, "orphaning" them so that no one could preserve them and no one knew who the copyrights belonged to). We believe the works in this collection are eligible for free public access under 17 U.S.C. Section 108(h) which allows for non-profit libraries and archives to reproduce, distribute, display and publicly perform a work if it meets the criteria of: a published work in the last twenty years of copyright, and after conducting a reasonable investigation, no commercial exploitation or copy at a reasonable price could be found. This provision was enacted at the same time as the Sonny Bono Copyright Term Extension Act. 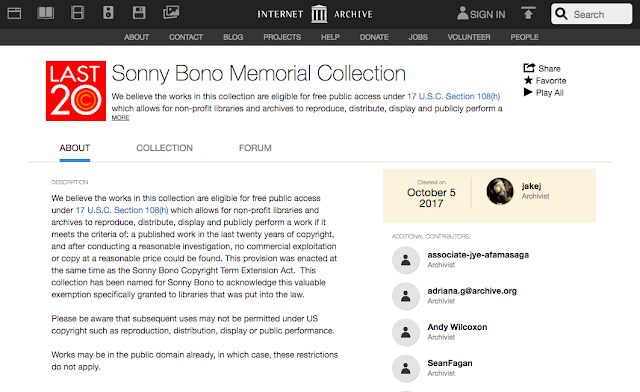 This collection has been named for Sonny Bono to acknowledge this valuable exemption specifically granted to libraries that was put into the law. Please be aware that subsequent uses may not be permitted under US copyright such as reproduction, distribution, display or public performance. Works may be in the public domain already, in which case, these restrictions do not apply. If you can read that and understand what it is saying, you can also understand why copyright law in the United States is such a disaster. I need to note, however, that Internet Archive or Archive.org now has over 14 million books online plus a lot of other stuff. For genealogists, many huge databases are going online on Archive.org and not yet on any other website. 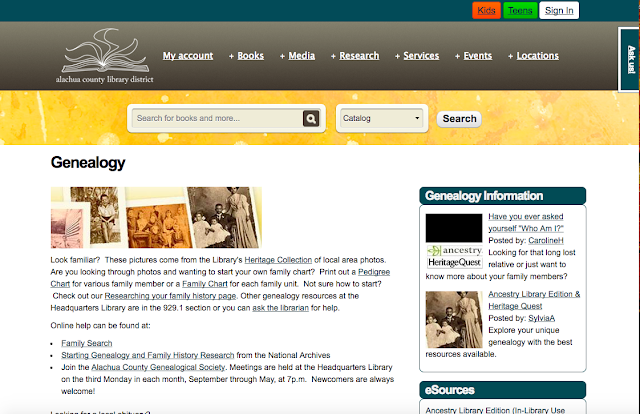 It is time to begin regularly using this website for genealogical research. Note: After contacting my unnamed sources in the desert outside of Mesa, Arizona, I was able to obtain this top secret report from the American Advanced Genealogical Study Institute reporting a recent study about the effects of doing genealogy for 14 hours a day, seven days a week for 15 years. Please be aware that I am not responsible for this reports contents. Any use of this report's contents is strictly the responsibility of the individual. I must also report that my source has since disappeared into the Superstition Wilderness Area looking for the Lost Dutchman Mine. 22 October 2017. The AAGSI has today concluded a study that it has been secretly conducting for the past 15 years on the effects of doing genealogy for 14 hours a day, seven days a week. The study was concluded when the study subject succumbed to the 45th disease in the study. However, the promising conclusions of the study were verified just before the study subject expired. Yes, the study strongly supports the findings that the study subject, a white male approximately 70 years old, had actually been cured of 44 previously incurable diseases. Before this study can be released to the public, it is necessary to substantiate the findings by doing another 15-year study using a group of grade school children. But because it will take approximately thirty years to train the children in genealogical research, the actual results of the follow-up study will not be available for approximately 45 years. Meanwhile, the AAGSI is secretly recruiting older test subjects who are already able to do research 14 hours a day, seven days a week. Participants will only be charged $1000 a month to participate in the study. This is where the document ends. 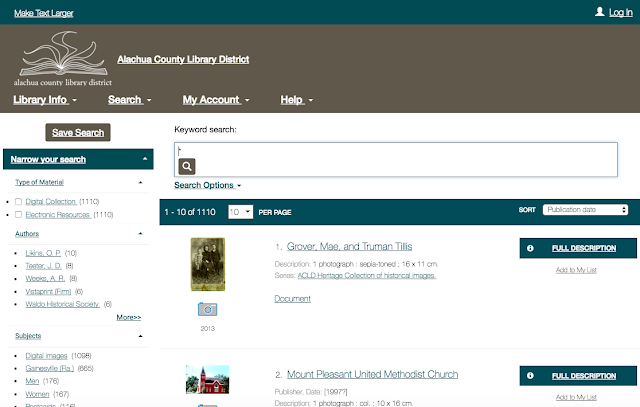 The genealogical resources that are available in local libraries often include local histories, photos, newspapers, and even journals, diaries, family bibles and other items of more than local interest. In addition, the librarians can be a source of valuable local information. I write about this topic from time to time because it is important that as we do research across the world to remember to check with the local libraries. By the way, I phone call does not constitute a visit. Sometimes phone calls will provide some information, but usually, a visit and taking the time to look at what is available will result in far more information. 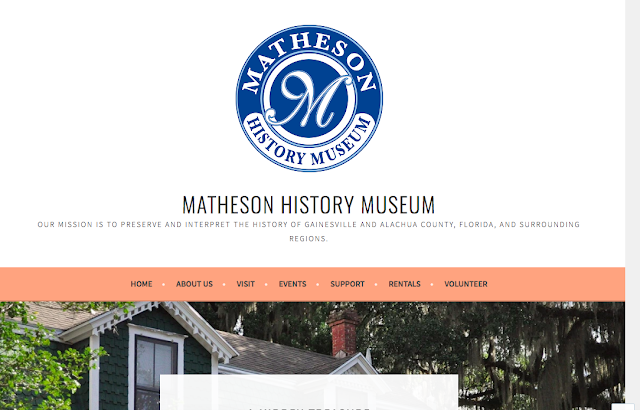 Here is the Alachua County Museum page. Now you have three places to visit in this same county. Be sure to check on operating hours and services before attempting a visit. 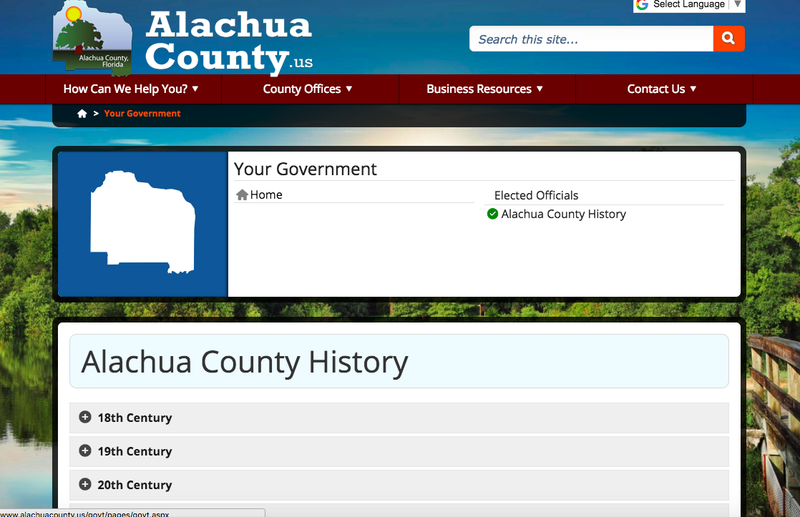 Also, don't forget the county websites. Many of them have leads to further information about the county's history. While you are doing research in the county, make time to visit and research in the court records and talk to local newspapers and mortuaries about their archives and records. So-called targeted advertising is now part of our online world thanks to Google and all those who think that it is an effective way to reach consumers. 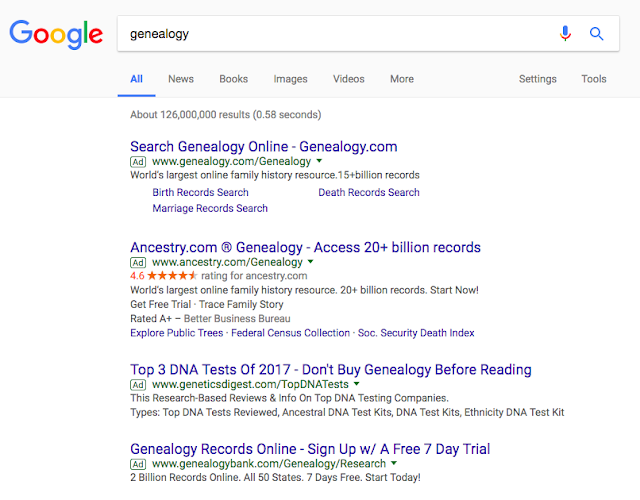 Even genealogists are affected when we start seeing ads for genealogically related products initiated by our searches for data on different websites. There are a lot of doomsayers and hand-wringers who predict the end of the world as we know it caused by Google trying to sell us products, but does targeted advertising really accomplish what they think it does? Many years ago, my wife and I started the tradition of opening our mail next to a garbage can. Most of the obvious junk mail goes directly into the garbage without even being opened. When the unsolicited or junk mail is opened, we generally do this in order to shred the contents that might contain information we do not wish disseminated. In addition, we have junk filters on our computers that filter out almost all the spam. But what about display ads? The idea behind targeted advertising is that as you do searches online, the information about you and your searches is used to match you up to products you would be interested in purchasing. Actually, this is not a new idea at all. Advertising companies have been targeting mailings for a long time. 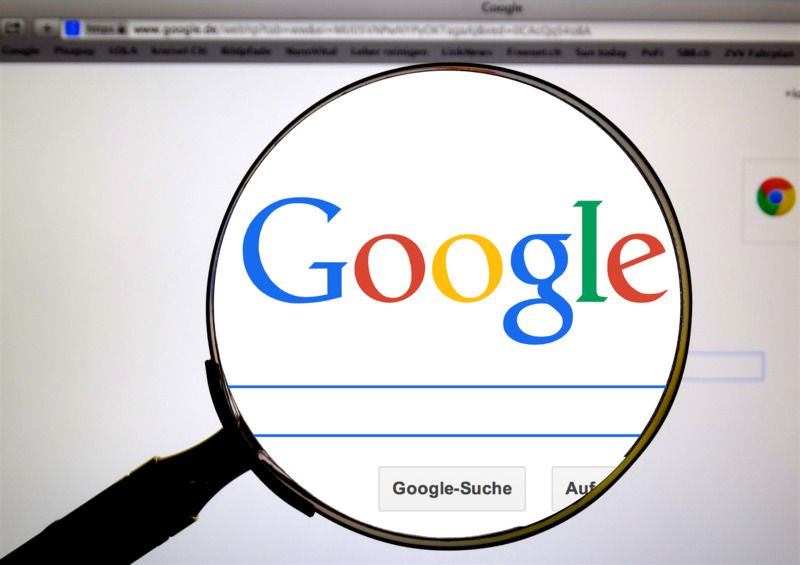 The reason the issue has become a concern is mainly based on the fact that Google and other search engines can gather so much more detailed information about us as users of their search services. This data is seen as a "threat" to our "privacy" and the unauthorized use of our personal information for profit. 1. Suppose I buy a replacement part for something that needs repair. I use the part to make the repair. Immediately, I start to get a series of online ads for the same part or related parts. I do not need the part again and I may never need the part again. The ads are mere noise and I am not induced in any way to buy the same part again that I only needed one time. This "one-time" issue goes for other items that I only purchase once a year or so. If I buy a new car, I am not likely to buy another new car for a long time so immediate ads for cars are simply noise and have no interest for me at all. 2. Again, let's suppose I search for a general topic such as "genealogy." On Google, my results will have one or more paid advertisements for genealogy-related websites. Here is an example. If I happened to click on one or more of these paid advertisements, Google would directly or indirectly make a very small amount of money. But if I had actually wanted to find any one of these four websites, I would have searched for the website directly. Google has no real way of determining my motivation for searching for a general term. In this case, I used the search term as an example in this blog (Note: if you are in to self-referential statements, this blog post is fast becoming one). 3. So-called targeted advertising is entirely subject driven. If I search for clothes, I get clothes ads and so forth. But my searches do not always fall into the category of an interest in purchasing products. Targeted advertising makes an invalid assumption that I am a constant and single-minded consumer when nearly all my decision to purchase items falls into categories that are not addressed by advertising. For example, I periodically need to maintain my cars including oil changes, tires, windshield wipers, etc. When I search for these items online, I have a specific item or service in mind. Suggestions of other products are merely noise. This is particularly evident when the ads are trying to sell me products I already use or purchase. The products I really need or want seldom, if ever, appear in the targeted advertising. Once I sign in to FamilySearch.org, my screen changes into a series of "targeted" ads for different features or products. Obviously, FamilySearch is not trying to get me to buy something, but they are trying to motivate me as a "consumer" of their services. 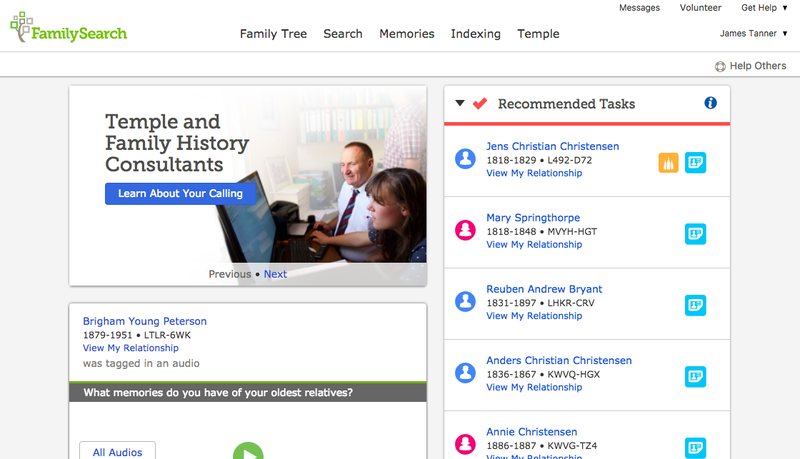 Yes, I am presently a "Temple and Family History Consultant" but the repeated ad does not take into account that I have already extensively "learned about my calling." Likewise, I am abundantly aware of Record Hints (i.e. the blue icon list on the right side of the page). In fact, all I really want to do is use the catalog or go to the Family Tree, this constant reminder of the services is nothing more or less than noise. 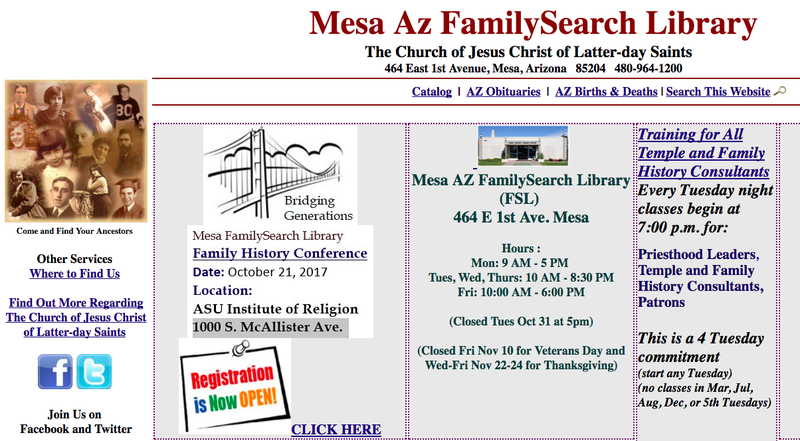 FamilySearch is certainly not alone in this practice of targeted advertising. Here is another example. Here again is a list of "Product and Services," most of which are merely redundant listings of the items in the menu bar. This list does not take into account that I already have purchased a DNA test from Ancestry.com and has "Learn about AncestryDNA" at the top of the list. In short, their targeted list includes nothing I am interested in when I go to Ancestry.com to do research or update my family tree. I know I can "customize" my Ancestry startup page, but I hardly notice this page as I continue to use the program. I am certain that there is a whole legion of Ancestry employees who agonize over what to put on this list and how to present it. Their entire effort is simply lost on me. What seems to be lost on most, if not all, of these online advertisers is that we ignore them. When the level of advertising reaches a certain point we also stop using their services. One common question I get from those who use FamilySearch.org is what are they supposed to do with the stuff that appears on their personalized startup page and my response is always to just ignore it unless there is something they are really interested in doing right at the moment. Yes, there are websites and services I will not use, simply because they saturate their online environment with advertising. Here is an example. There is nothing that will make me use Yahoo.com. I do not want and will not look at the stuff on this website. Aaron Godfrey - VP of Marketing for MyHeritage.com appeared on ITV's Good Morning Britain. MyHeritage also recently appeared on Russell Brand's popular radio show which you can watch here. 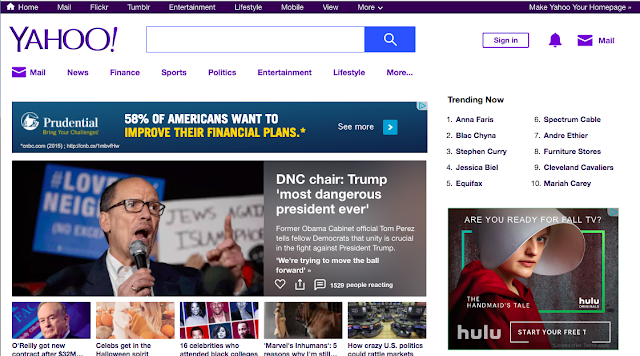 Here is the United States, MyHeritage has not had a high-level media presence, especially when compared to another of the huge online genealogy companies. But recently, I have been seeing some MyHeritage.com video ads on YouTube.com so I am guessing that the company is finally making a move into a higher level of marketing visibility here in the U.S. as well as in Great Britain. 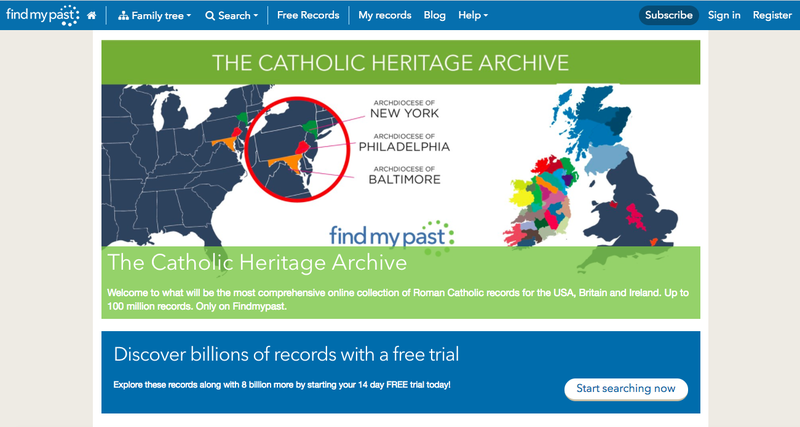 Findmypast.com is making a huge effort to build what will become the largest online archive of Catholic Church Records from the United States, the United Kingdom, and Ireland. The archive will ultimately have approximately 100 million online, digitized records. These records have already begun to appear online and will ultimately provide an insight into records that have not previously been available. 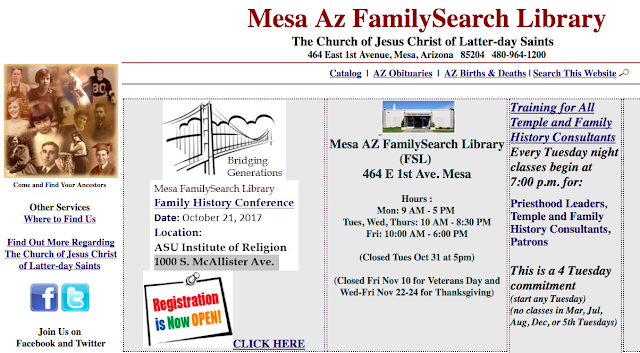 As I write this post, I am in Mesa, Arizona to attend and present at the Mesa FamilySearch Library's Annual Family History Conference. My wife and I will both be participating in this conference and during one hour of the conference, we will both be teaching at the same time. We enjoy coming down to Mesa from our relatively new home in Provo, Utah to attend the conference and renew old friendships. In years past, I have taught every hour of the conference, but this year, I will have a couple of breaks in between classes to answer questions and talk to my friends. In a larger sense, this particular conference marks a turning point in our participation in the genealogical community. This will be the last scheduled conference we will attend before leaving to go on a full-time, one year, mission for The Church of Jesus Christ of Latter-day Saints. We will be serving as record preservation specialists in the Washington, D.C. North Mission. We are presently assigned to work at the Maryland State Archives in Annapolis, Maryland. We are looking forward to this opportunity to do some of the "real" work of genealogy, the preservation of records. Many of my friends and associates have asked about my continued participation in the international genealogical community particularly whether or not I will keep writing my blogs. Right now, that is an unanswered question. We will have to wait and see the extent of our involvement and responsibilities during the coming year. But, I will still keep writing and probably taking photographs. Whether that includes the time to post those online: we will have to wait and see. But I doubt that we will be attending any conferences during the coming year although we may get the opportunity to teach some classes and do some other presentations. We plan to be back after a year. 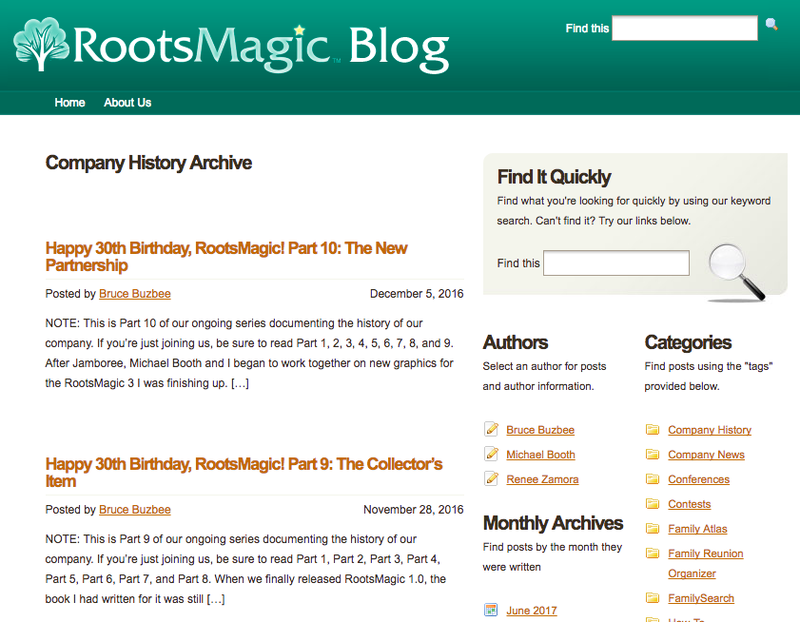 For many years now, RootsMagic.com has been a mainstay of the genealogy software market. Last year, was the official 39th Anniversary of the company that ultimately developed the product we have today. In a series of continuing blog posts, Bruce Buzbee, the developer of the program, relates the history of the ultimate development of the product. As Bruce notes, it is appropriate for a company that specializes in genealogy to have a recorded history. What I think is even more important is the fact that the history of many of the major genealogy programs and companies is extremely difficult to find if such histories exist at all. Wikipedia is about the only really available source for the history of companies such as Ancestry.com and FamilySearch.org. I speculate that many of these companies are so focused on "proprietary" and internal information that they do not want to publicize their own history. I hope Bruce does continue his company's history and I would also hope that such a history becomes an example and at the same time an incentive to other companies to compile and tell their own stories. My own software roots go back to the very first programs developed for the Apple II computers back in the 1980s so for me, this is not only the history of genealogy software companies, but it is in part, my own history. Here is the link to the current blog posts by Bruce Buzbee about the history of RootsMagic. 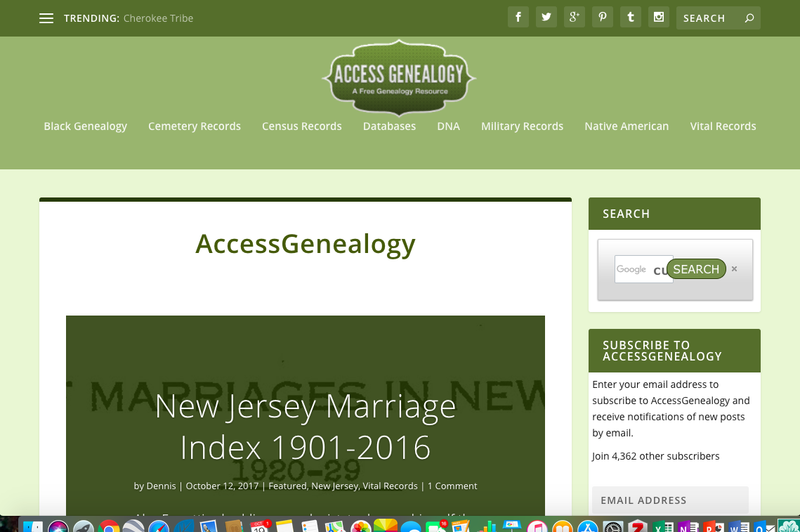 AccessGenealogy.com is an aggregator website that acts as a portal to a sizable collection of genealogy-related links. It is owned and operated by Dennis N. Partridge, a long-time genealogy website developer. He owns and operates quite a number of other websites. See http://www.surnameguide.com/about.htm. These types of websites help you to understand the variety of records available online. In this regard, this website operates as a catalog of other websites you might want to search. Having a central location for finding these other websites by topic or geographic area was more of an advantage in the early years of the internet when search engines such as Google did not dominate every aspect of searching on the internet. However, even with a search engine such as Google, you still have to know something about the subject you are searching to find anything helpful. This website and other similar websites help you to learn how to find additional information by making you aware of the huge number of options that are available and presenting an organized offering of websites. 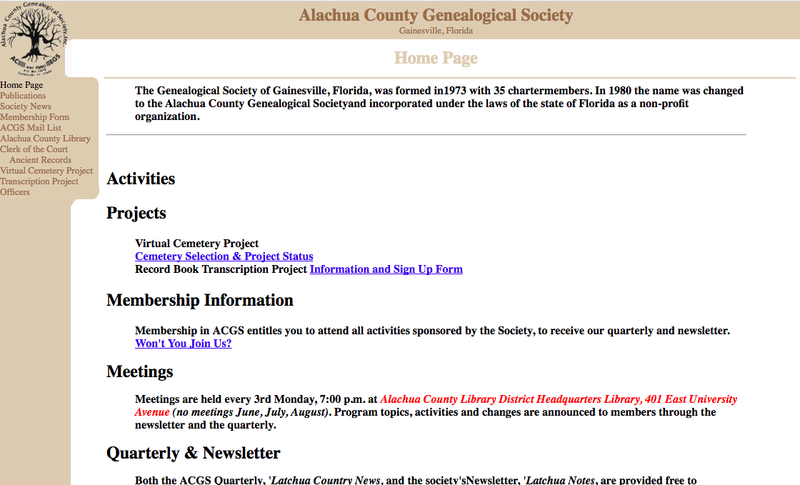 Aggregator websites are not usually as useful and legitimate as AccessGenealogy.com. Sometimes, they simply aggregate a limited list of other websites or copy information from other websites automatically for the purpose of getting hits on advertising. They are close cousins to the "vampire websites" that prey on people who mistype the address of a popular website. 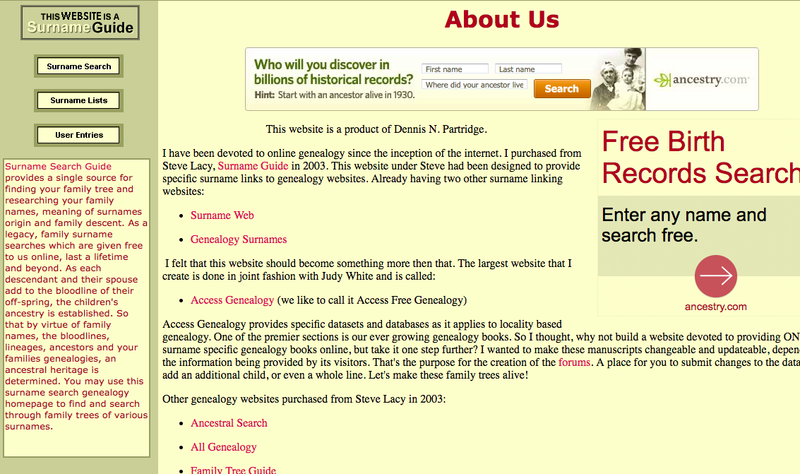 For example, don't try this" but if you type "Ancesty.com" instead of Ancestry.com, you will get a vampire website. AccessGenealogy.com is a useful and well-presented website. 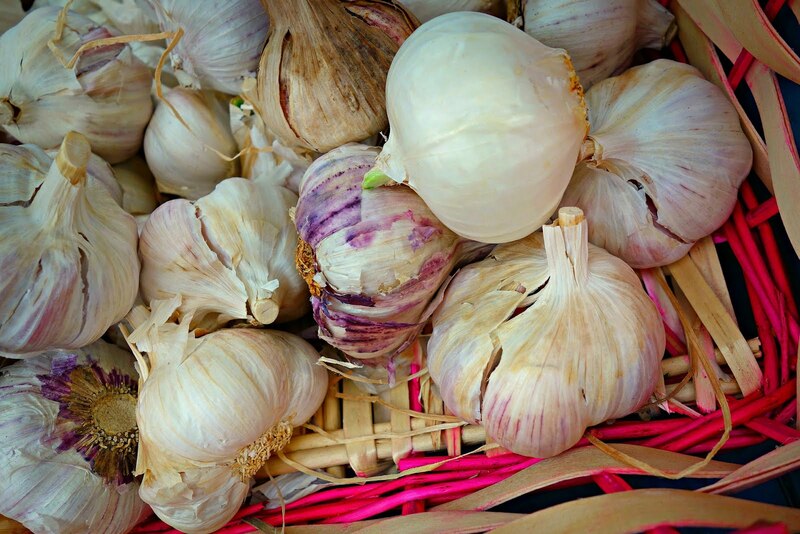 It should not be judged by its annoying online cousins. The official FamilySearch training partner, The Family History Guide, has achieved IRS 501 (c) (3) status. This means that anyone donating money to support this fabulous, genealogical training and now, charitable resource, can get a corresponding deduction from their Federal income taxes. By keeping the website free, the developers hope to fulfill their mission to get more people involved in family history by providing training and research guidance on a major scale with a free website. Up to this point, the website has been self-funded with all the support coming from the people who have developed and maintained the website so far. The Family History Guide has been vetted by The Church of Jesus Christ of Latter-day Saints and made available to over 5,000 Family History Centers throughout the world and on LDS.org. 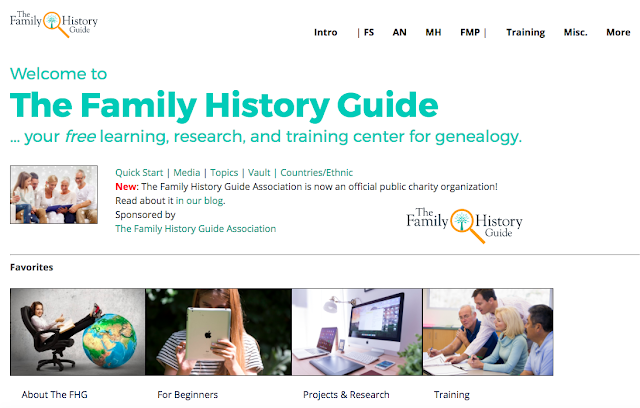 The Family History Guide already has users in over 150 countries and most recently released training paths for MyHeritage.com, Findmypast.com, and Ancestry.com, as well as maintaining its support for FamilySearch.org. This week they are rolling out a national pilot project to recruit, train and utilize Regional Training Specialists to serve in specific geographic regions throughout the United States (initially). These individuals will extend the reach and facilitate quality training and presentations for the website. 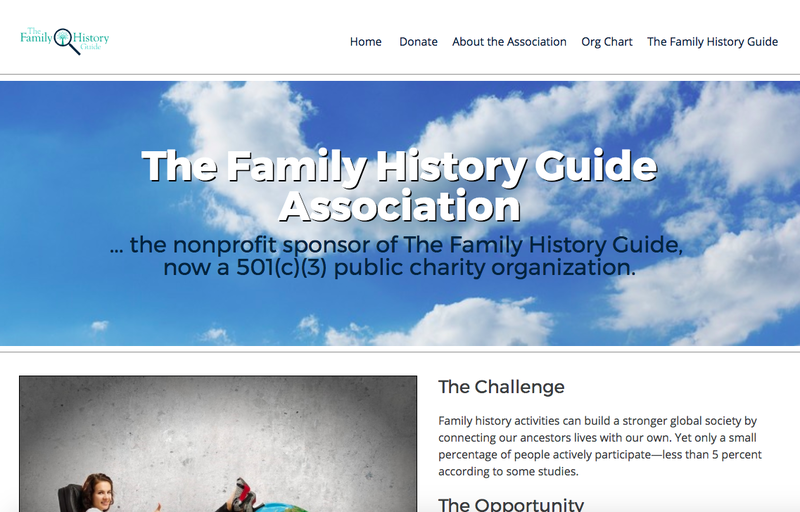 The actual entity that supports the website is The Family History Guide Association. There are links on the Association's website to an explanation about how to donate. Over the years, I have from time to time examined the relative search capabilities of the various search engines available to genealogists and the rest of the world for that matter. I have varied the methodology and search criteria and without fail have always come up with similar results. But since I had not done this for quite a while, I decided it was time to check and see if I might get any different results. During that same time period, the dominance of Google Searches has increased dramatically. As I noted in a recent post, Google presently has about an 86% market share worldwide. Here is a graph showing that dominance. 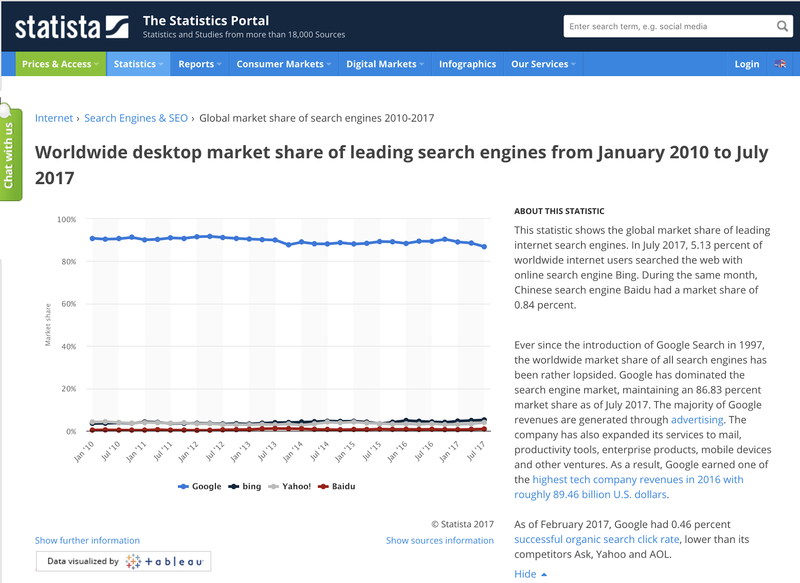 One reason that this is an interesting statistic is that many of the computers sold come with preloaded software and give a preference to another search engine, most commonly, Microsoft's Bing. Apparently, users switch to Google. There are four search engines in the above graph. The fourth one is Baidu, a Chinese search engine. However, if we look at the statistics for the United States, the differences are not quite so dramatic. I think that if this particular study targeted genealogists, my impression is that the differences would be even less. I find a significant number of genealogists using search engines other than Google. Product selection is based on a huge number of criteria. Why people use a certain product is often based merely on the fact that it was the first product that they used. It is also a question as to why one product so dramatically dominates an entire market. This is the case with Google. From my perspective, I use Google almost exclusively because I get the most pertinent results from my searches. For example, already this morning while writing I have done around 70 searches. I am fully aware that some people who use other search engines have specific reasons why they choose to do so. But I'm also aware that most people I deal with simply do not think about it. I'm also aware that many people would not know how to change their search engine even if they wanted to do so. By the way, you can find instructions about changing your search engine by doing a search. For example, searching for "change my search engine to Google" or some other search. One problem with trying to show different search capabilities that developed during my past attempts was the fact that Google records all of the searches made and if I repeat a search I will get different results than if I make a search that has not been made previously. If you do a search repeatedly, Google will note the fact and provide results that are more targeted each time you do the search. If you have difficulty finding the results of your searches, perhaps you need to learn different search techniques. In the past, the results showed a clear advantage in using Google for doing searches. But now, because of the targeted searches returned by Google, the differences are more in the quality of the items returned rather than sheer numbers. I think all of us could agree that having hundreds of thousands of results is really not very helpful. What I do suggest is that individuals review their ability to produce any results from searching online and get help if they feel frustrated in their ability to find meaningful results. I also suggest trying a variety of search engines to get a feel for their responses. You can do searches in various search engines by simply searching for the names and going to their individual websites. For example, if you search for "Bing.com" you can make a search using Bing. Genealogy (ISSN 2313-5778) is an international, scholarly, open access journal devoted to the analysis of genealogical narratives (with applications for family, race/ethnic, gender, migration and science studies) and scholarship that uses genealogical theory and methodologies to examine historical processes. Open Access - free for readers, free publication for well-prepared manuscripts submitted in 2017. Rapid publication: manuscripts are peer-reviewed and a first decision provided to authors approximately 34 days after submission; acceptance to publication is undertaken in 7 days (median values for papers published in this journal in first half of 2017). MDPI (Multidisciplinary Digital Publishing Institute) is an academic open-access publisher with headquarters in Basel, Switzerland. Additional offices are located in Beijing and Wuhan (China), Barcelona (Spain) as well as in Belgrade (Serbia). MDPI publishes 182 diverse peer-reviewed, scientific, open access, electronic journals, including Molecules (launched in 1996; Impact Factor 2.861), the International Journal of Molecular Sciences (launched in 2000; Impact Factor 3.226), Sensors (launched in 2001; Impact Factor 2.677), Marine Drugs (launched in 2003; Impact Factor 3.503), Energies (launched in 2008; Impact Factor 2.262), the International Journal of Environmental Research and Public Health (launched in 2004; Impact Factor 2.101), Viruses(launched in 2009; Impact Factor 3.465), Remote Sensing (launched in 2009; Impact Factor 3.244), Toxins (launched in 2009; Impact Factor 3.030) and Nutrients (launched in 2009; Impact Factor 3.550). Our publishing activities are supported by more than 15,700 active scientists and academic editors on our journals' international editorial boards, including several Nobelists. More than 263,500 individual authors have already published with MDPI. MDPI.com receives more than 8.4 million monthly webpage views. As a result, the genealogical method can be used to dissolve standards of truth that have been posited as timeless and universal (this is its non-teleological moment). And after it has established the fluid and contingent nature of truth it can go on to fashion narratives that are told from a specific cultural-historical locus (the point at which it re-engages teleology, with a small “t”). But again, this is where genealogies get into trouble with the modern paradigm of knowledge; because they draw attention to another disturbing truth. It’s not possible to cleanly separate the analysis of historical processes from the creative work that is used to steer history in new directions. The genealogist is always, at some level, participating in making the histories on which they are reporting. 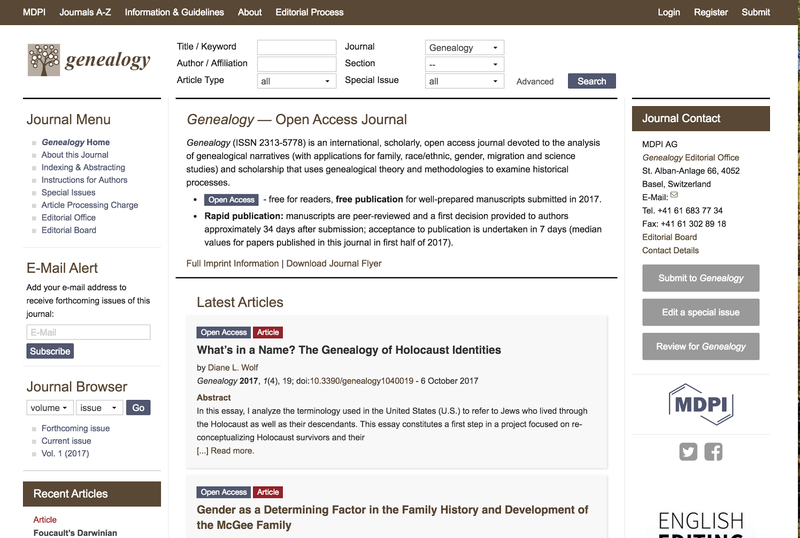 If you would like to spend some time thinking about genealogy as a concept and as an academic subject you may find many of these articles interesting. Searching online using Google Search becomes almost automatic over time. But unless you become aware of some of the additional tools available from Google, you may be driving in first gear without knowing how to shift gears. Searching is the lifeblood of genealogists. Every time we sit down to find our ancestors or relatives, we are searching. How we search changes as we learn more about what we are trying to accomplish, but we can get to the point where we are stalled in our search efforts both by the availability of records and by our own limitations in understanding more effective ways to search. Online searching is a learned skill. No one is born with online searching skills. Everyone has to learn how to do effective searches. First a word (really lots of words) about browsers and search engines. Browsers are the programs that run on your computer or other devices that connect you to the internet. Some common browsers include Chrome, Internet Explorer (now obsolete), Firefox, Safari, Opera, and Edge. There are dozens of other browsers out there. See Wikipedia: List of web browsers. Google's Chrome browser has well over half of all the market share for browsers worldwide. None of the others garner more than about 12% with Safari in second place and the other down in very low percentages. See Statcounter.com: Brower Market Share Worldwide. If you purchased a Windows-based computer, you probably inherited a Microsoft browser and have never changed. I usually have four browser programs on my computer and can switch between them if I encounter an issue with a website not functioning or displaying properly. There is a good reason for Chrome's popularity: it works and has a huge number of add-ons and extensions. What about search engines? A search engine is a web-based program that uses your browser to search for information from websites on the internet. Search engines are browser independent so you can use any browser with any search engine. Google Search is the most popular browser in the world and has about an 87% market share in 2017. See Statista.com: Worldwide desktop market share of leading search engines from January 2010 to July 2017. There is always a reason for this kind of dominance. 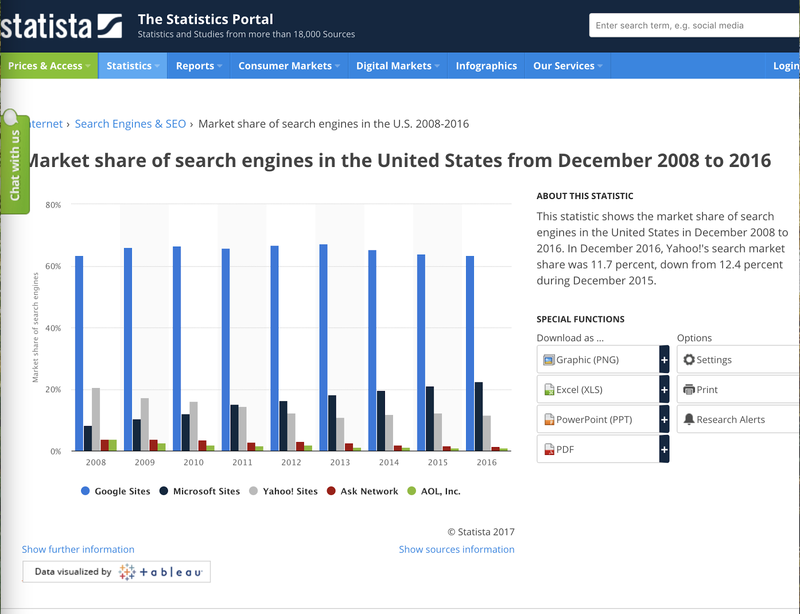 Microsoft's Bing, the second most popular search engine has a 5.7% market share. If you are using one of the other search engines, such as Bing, Yahoo, AOL or whatever, you might consider doing your serious genealogical searches using Chrome with Google. Enough said at this point, but I do think it is time I came back to this subject. In the past, I have done test searches and reported the results to show what happens with several search engines. I will do that again when I finish this post. Google has several "search operators" which include special typographical symbols or commands that enhance or focus your searches. Google Search Help has a web page called "Refine web searches" that lists some of the commands and symbols available. I suggest looking through the list and selecting a few such operators to add to your search arsenal. I frequently use phrases in quotes to search for individal's names. Some people frequently use wildcards. I also use the command define: to define words and phrases. There is also a list of search operators, power tips and other useful information on the MIT Libraries website in an article entitled, "Google Search Tips: Getting Started." One comment, however, is that the "+" or plus sign has been removed from Google's search operators. It has been deemed unnecessary. I use very few search operators because I rarely need them. 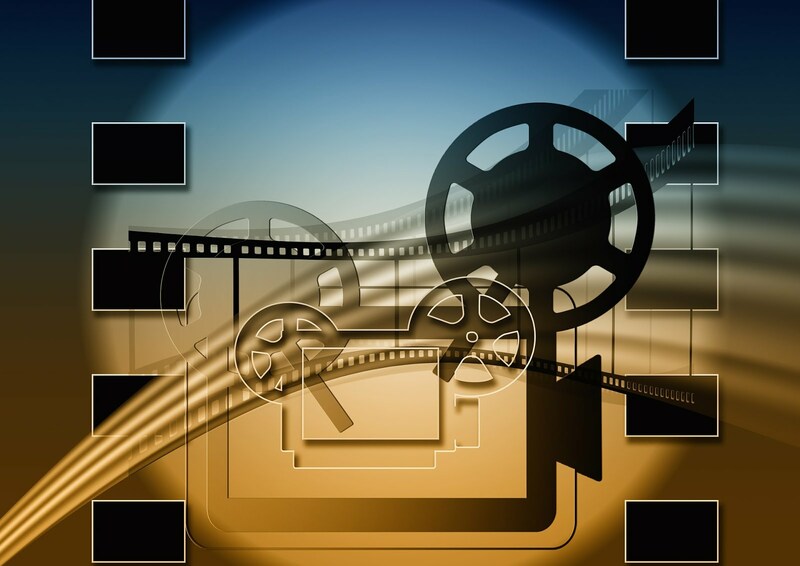 I have noted in several posts and presentations, that I can usually make a number of searches and find what I need in the time it takes to construct special formulaic searches.